With the week's forecast looking unpromising for WA, I decided to take another trip down to the land of eternal sunshine, where I had skied great runs on Lassen and Shasta in the first week of June. I spent all of Sunday afternoon and evening driving down to Lassen Peak, arriving at the summit parking lot at 8500 ft by 10:30 pm. The park road had just opened completely a few days earlier, and there was still a solid 8-10 ft snowpack at the summit. This has got to be the deepest snowpack of any place you can drive to right now in North America, and probably even the world. This time I headed for the west side, where a steep gully wraps around the edge of the 1915 lava flow which flows out of the summit crater and down the west face. �This gully drops down into an excellent S-shaped bowl. The snow on this side was just beginning to soften at 1 pm, the upper gully needed another hour, but sweet corn was ready in the bowl below 10000 ft. �I skied down to 8400 ft, then traversed on skins back south through the Eagle Peak saddle at 8800 ft and skied down to the summit lot. The west side was definitely worth another run (or two) as it was only 2 pm, and my total skiing vert was only 3300 ft for the day. But I needed to save my energy since I was planning to ski Shasta the next day, so I wrapped things up with a photo-taking tour through the north side of the park and headed for Shasta City. 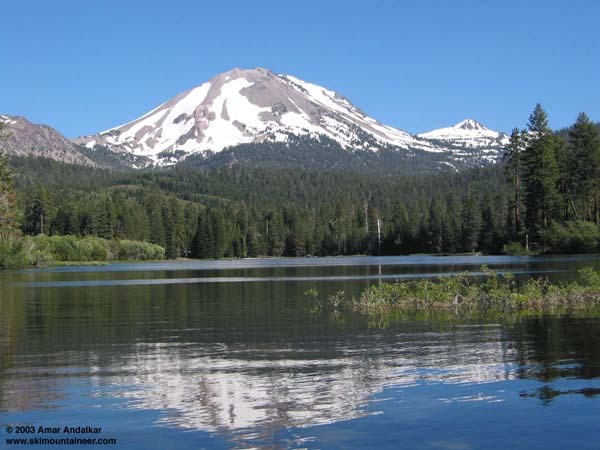 This photo shows the classic view of Lassen Peak from Manzanita Lake. The west side route is seen very obliquely just below the right skyline, with the gully dropping in behind the black lava flow. Eagle Peak (9222 ft) is the prominent knob at right, and the summit lot is behind the saddle separating it from Lassen.